We invite all of our members to attend and be part of the fun. Unlike the monthly book exchanges, you need to sign up for the holiday card exchange by the end of October. If you missed the deadline, please make sure to come anyway. We don't want to miss seeing you. Everyone is invited and asked to bring a goody to share. Finger foods are requested, and please, nothing too gooey since we'll be handling the beautiful cards. We will not have the library with us at this gathering, but there will be a box so you can return any books you may have checked out. Or, you may keep checked out books until the January meeting. The directions to Sandy's home will be in the newsletter. 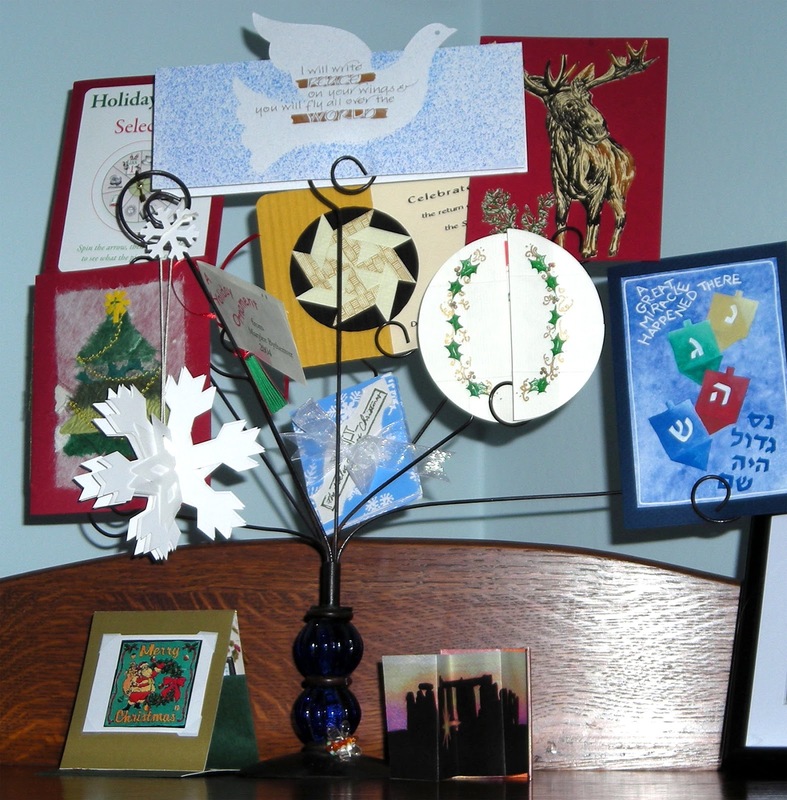 Here's an example of some holiday cards from past exchanges. by the participants in the exchange. This month, Becky McAllister led the workshop about stamping, embossing and using a texture machine. Kathy Warren assisted her. Becky gave us a very complete picture of the various types of stamps, inks and techniques for using stamps. And we even looked at a texture machine using texture envelopes. This picture looks from the leader's table onto the book exchange. Our regular room was not available. Becky and Kathy getting started. Becky and Kathy brought lots and lots of stamps and other materials to try out. In the window behind the table are even more supplies. Closest to the front are some samples, then the clear plastic bases for cling stamps and rubber stamps mounted on wood. There are water color markers for coloring directly on stamps. Frequently our instructions describe how things are made. and techniques so it is much more a reference than instruction sheet. The fish images are to show us different ways to use masks (post-its). make a second print on a sticky, cut it out and place it directly over the stamp. Then you can stamp or spray and not disturb your original image. were done on tissue paper with sparkles. These two samples couldn't be more different nor more lovely. On the left, a clear ink is stamped on a piece of glossy paper. After the image dries (in this case the reindeer), you rub a water based dye ink over the paper and the invisible ink resists much of the color. On the right are the results of using two different colors of watercolor brushes to apply color to a stamp. Then Becky applied a quick spritz of water over it. The result was very much like a watercolor and it can be of different colors. We also did more conventional stamping with pigmented inks and heat guns. We even had the opportunity to use a Sizzix. Lots of "thank yous"
to use in addition to all of their stamps and other materials. We end with pictures of NORBAG members doing what they do best...laughing, talking, and playing. The Bainbridge Island Museum of Art (BIMA) has a wonderful room dedicated to book art. Cynthia Sears has amassed a collection of books from artists all over the world as well as from local artists. The exhibit changes several times a year and features different themes and/or artists. The current display titled Bound to be Art, includes the work of Washington artists and some fabulous books from Iceland. Here is a small sample of some of these beautiful books.